The Kodak Verité 55 Mega Plus is a good option for those seeking an all-in-one piece of equipment that can print, scan and copy. The flatbed has dimensions of 8.5 x 11.7 inches that can accommodate a number of different paper sizes. With a recommended monthly print volume of 300 pages, this inkjet printer is suited for use in a home office or small business. The Kodak Verité 55 Mega Plus has an understated look with its black casing making it an inconspicuous addition to a home office. It has dimensions of approximately 19.37 x 12.48 x 7.87 inches and weighs 4.5 kg. 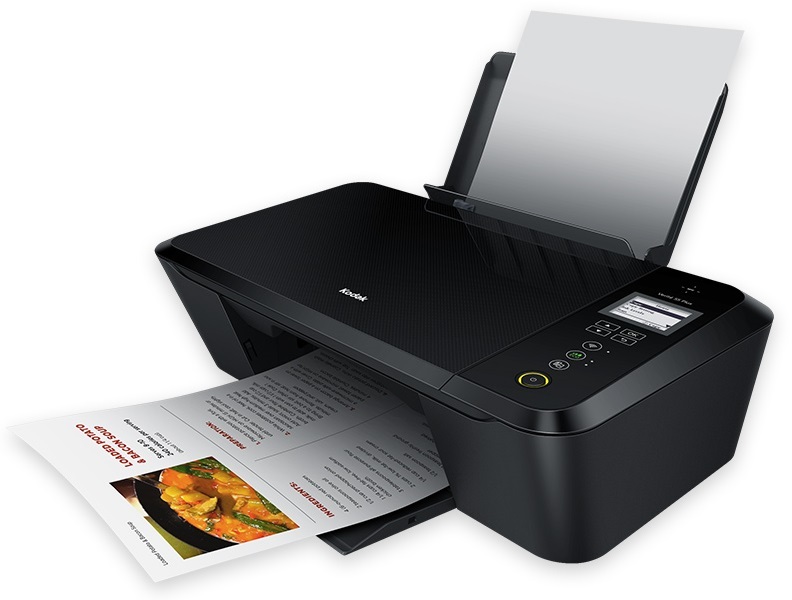 It holds two cartridges and has a print speed of 10 ppm in black and 4.2 ppm in colour. The scan resolution of 1200 x 1200 dpi is sufficient for clear results in respect to the quality of text and images. It is controlled via a 2-inch LCD screen, which is easy to understand and use. The Kodak Verité 55 Mega Plus can use 3XL ink cartridges, which enable three times as many pages to be printed when compared to standard cartridges. The printer also has an Eco Button, which can be pushed to make the printer use 20-30% less ink and print up to 1,500 pages, saving time, expense and effort. It has wireless connectivity for printing from a phone, tablet or laptop which eliminates the need for bulky cables. With the use of the app, it is possible to scan and upload documents at the touch of a button. The Kodak Verité 55 Mega Plus is unable to support duplex printing, only one-sided printing. The physical size of the machine is not as compact as other machines with comparable functions. The quality of the photos printed could have been better.